In February we published the findings from the 2018 ALT Annual Survey. This was the fifth Annual Survey and it along the the data from previous surveys provides a useful insight into understanding current and future practice within the field of Learning Technology along with the enablers and drivers for its use. Whilst the Annual Survey includes basic demographic data in its reporting this data has not previously been used to analyse responses. As part of International Womens Day 2019 ALT’s Dr Maren Deepwell and Martin Hawksey were invited to contribute a keynote address at the University of the Highlands and Islands about promoting equality from professional practice and organisational culture to personal commitment. As part of this presentation data form the Annual Survey has been re-analysed to explore equality in Learning Technology from a gender perspective. An overview of this new analysis has been shared by Martin Hawksey on his personal blog and openly shared in the ALT Repository. 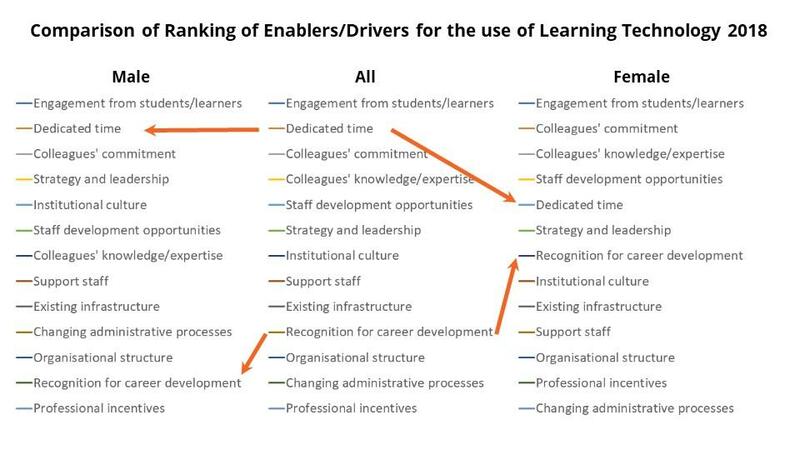 This includes analysis of professional roles by gender and also comparing views on enablers and drivers in the use of Learning Technology which are a core part of the survey. To supplement this analysis and give Members the opportunity to express an interest in further work on exploring gender equality in Learning Technology Maren Deepwell and Martin Hawksey will be share their perspectives as part of a webinar on 15 May 2019 12:30-1:30pm BST ‘Equality in Learning Technology: New insights from ALT's Annual Survey’. Visit the event page to read more and register.